For a Claim which is accepted by the FDRC as a Standard Eligible Disputes under Terms of Reference (Jan 2018) and cases under Terms of Reference (Feb 2014), it shall proceed in accordance with the sequence the “Mediation First, Arbitration Next”. For a Claim which is accepted by the FDRC as an Extended Eligible Disputes under Terms of Reference (Jan 2018), it may be processed under “Mediation First, Arbitration Next”, “Mediation Only” or “Arbitration Only”, provided that the EC and the relevant FI (the “Parties”) have given their signed consent. When an Application is first received, FDRC’s Case Officer will verify if the application is within FDRC’s Terms of Reference. If the case is accepted for “Mediation First, Arbitration Next” or “Mediation Only”, both the Eligible Claimant and the relevant financial institution shall pay the required Fees for Mediation. The Case Officer will arrange for the Mediation to be conducted. 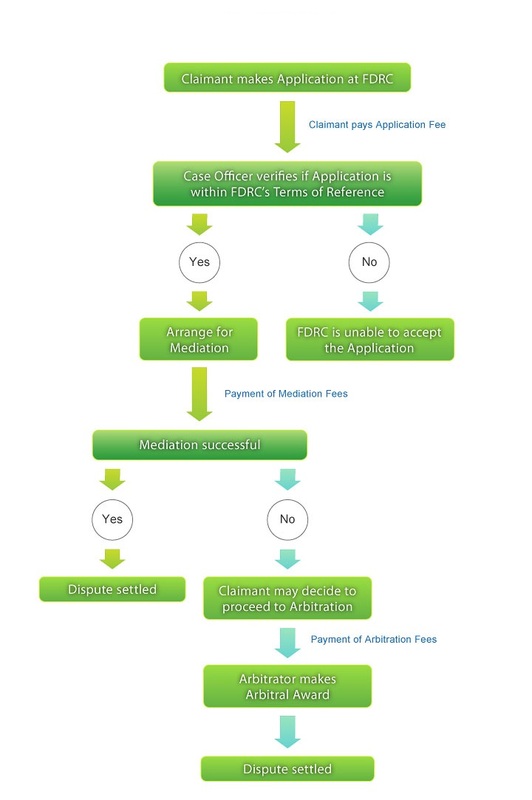 If the case is accepted for “Mediation First, Arbitration Next” or “Arbitration Only”, both the Claimant and the relevant financial institution shall pay the required Fees. The Case Officer will arrange for the Arbitration after the Claimant file the written request for Arbitration to the FDRC. Where the claim that is accepted for “Mediation First, Arbitration Next” is not resolved by Mediation, the Claimant hall file the written request for Arbitration to the FDRC within 60 days from the date of the Mediation Certificate if wish to proceed to Arbitration. The FDRC conducts Arbitration on a “documents-only” basis. Under exceptional circumstances, the Arbitrator may call for an in-person hearing. An Arbitral Award is final and binding and can only be appealed on point of law. You are welcome to attend our Free Public Enquiry Meetingby appointment. During the Free Public Enquiry Meeting, the enquirer would get to know more about our services and how mediation and/or arbitration can help to solve their dispute.